Photo taken by me at the new Trump Tower during the Vancouver Women’s March on January 21, 2017. It’s been a hard week for many of us. I’ve noticed at conferences and gatherings that there are many colleagues in the credit union movement who don’t get into politics, and at times that’s a lovely respite from all the arguing. We all want to see our communities increase their self-reliance. Whether you’re into it because you like to see a non-governmental actor dive into the solution or because you see the need for progressive financial institutions shoring up what should be the government’s responsibility, we are working for common goals. I came across this excellent five-part podcast from NPR’s On The Media about poverty in America called Busted: America’s Poverty Myths. I believe this should be required listening to any of us who believe in the core purpose of a credit union to increase the financial inclusion of our neighbours. What would result if groups of people in your co-operatives listened to this and came together, book-club style to discuss? What would happen if we invited our boards and members into that dialogue? Poverty is real and often our belief in a meritocracy is just that: more a belief than a reality. I offer up the following for discussion. Originally published on the CU Water Cooler. Vancity’s plans to accelerate impact. I wrote a blog post for the CU Water Cooler today about the public release of Vancity’s internal Three Year Plan. Why publish our internal plans? It’s all about transparency and getting the word out about what we’re doing, in the hopes that publishing our plans will be useful to our sister credit unions and co-operatives, as well as values-based banks and organizations focused on marrying their economic performance with environmental and/or social performance. Check it out, and please comment on the article if you have something to add. My third post on values-based banking. In June, I was lucky enough to be Vancity’s representative at a meeting of the Global Alliance for Banking on Values in Copenhagen. I have tried to sum up that experience in three posts on the Credit Union Water Cooler site. The third and final post was published today. It’s called Citizen Bankers. Please take a look and leave a comment on the site if you have something to add or ask. My first two posts were From Community-based to Values-based and The Banking Commons. I’m humbled by my experience in Copenhagen with my Global Alliance colleagues – I am still unwrapping my lessons and the world of possibilities discovered during my time with them – and am very proud of these three posts. 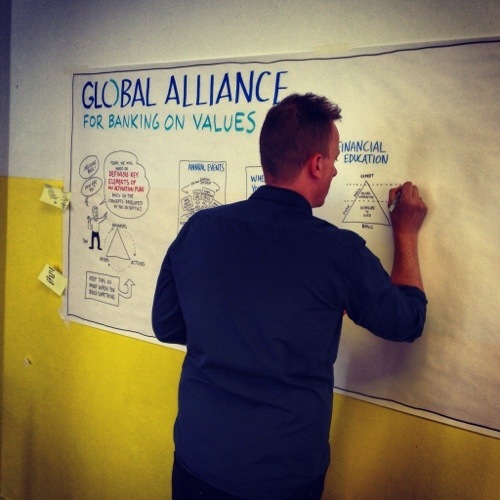 The first part of my three part series of posts on my experience in Copenhagen at the Global Alliance for Banking on Values meeting was published today on the CU Water Cooler site.